Here is a nifty little find. They are from the 1970's and 80's. 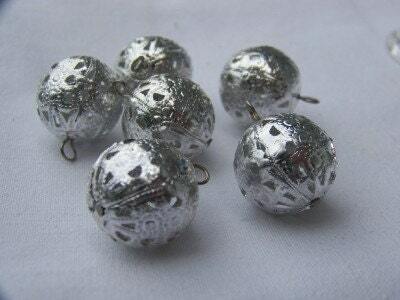 These filigree balls are made from aluminum and come with a loop for hanging as a charms or drop. If you want to use them as beads simply remove the loop. These measure 15mm. You will reveive 6 of them. Will make great miniature ornaments. Just received the lovely goodies. I love the multicoloured packages with smiley stickers, almost feels like Christmas ! Thanks !